There is a local company offering these guys: Biota Captive Bred Mandarins. They are fed frozen and pelleted foods, as well as graze on pods of course. Living about 15 min from the warehouse I can pick them up as well as pods any time during business hours. Anyone purchase a captive bred Mandarin and how did it go? I am familiar with how they can eat a bunch of pods, more than a average keeper would raise. What other obstacles are there to consider? Are the "wait a year to have a mature tank" to accomodate the pods population? Tank size is one, but if not for the tank supporting the pod population and the fish eats regular foods being fed and dosed about every 10 days with a bag of pods. What size tank would be good for him to reside? It would be him and a Yellow Clown Goby, and maybe a Royal Gramma, an Orchid Dotty back or something colorful. 28G a possiblity with lots of rock? Or with Pipefish and in a 50G??? I have had the same LR in my nano tank for 4 years and my other tank has been cycled for about 4 months up for 6 almost 7 months. I am fairly patient so I can wait. It is unlikely that Captive bred fish will not be available in the future. So Not worried about that. But if it may be possible to keep a (maybe even a pair of) Mandarins, I would like to start getting planned up /prepared for such a tank. So ideas and thoughts please? Planning to talk the the vendor about the tanks they feel they should be in too. They will always need a pod population, but the ones that are captive bred are 'easier' to keep since they will eat pellets from a feeding station. Still isn't easy. From all I have been reading it is work and money to keep them. Still is an intriguing consideration. since I attempted 2 times with no luck , I miss my lil guy it's just hard seeing them make it . I took me almost 2 years to get him to eat frozen and pellets, definitely hard work. I did read something about the spotted ones being a little easier to keep , but I can't find that article again for the life of me . Still hopeful. Have resisted for 4 years for all the right and obvious reasons. those red guys are nice you should ask paul about those guys he had one a short time back. So darling in their behavior and really stunning. How long are they supposed to live? Don't seem to see that info??? I had a Red Scooter and he was eating pelleted food and defrosted frozen well and I would buy Pods regularly and see him perched and stalking them and then one day dead. Maybe had him around a year. He never looked thin or sick or not eating. All looked normal. That death was one reason I had come to the conclusion a Dragonette would not be in my tank again. Since he was even eating and died I was unsure of why. Very sad he was a favorite and would come looking for food when I would go to the tank. Parameters were fine. Other fish fine too. It could have been a number of things I guess. They are adorable. 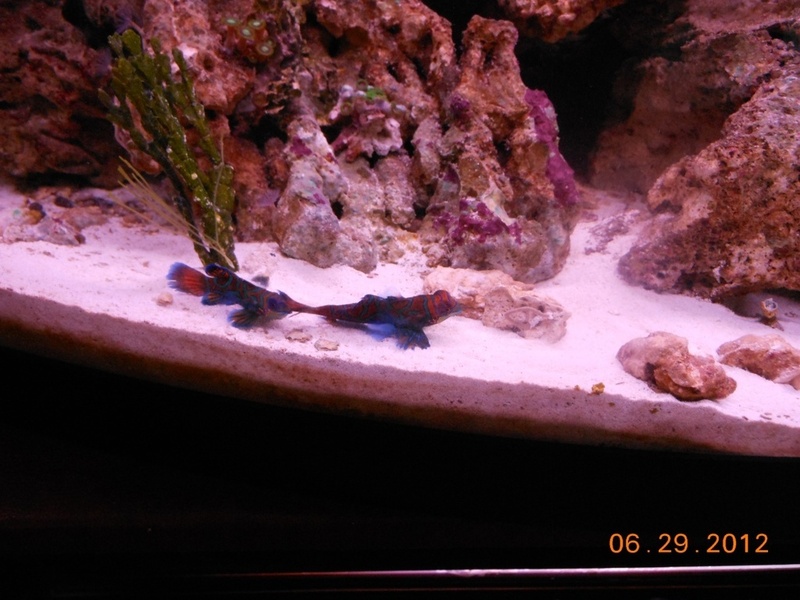 For now my Yellow clown Goby is a cute one and living a long life maybe 3 years or so now. Begs like a puppy. An enjoyable, interactive aqua critter. It is in Longmont, AlgaeBarn. I think they wanted 80 but that includes a "$55 pods and phytoplankton food package" Don't really think it is $55. worth but who knows. Your local store sounded like a better value.